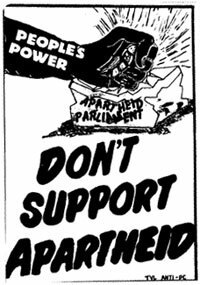 Eighteen years after the fascist National Party government of South Africa was removed from power, their policies of apartheid continue under the rule of the previous 'freedom fighters' organisation, the African National Congress. 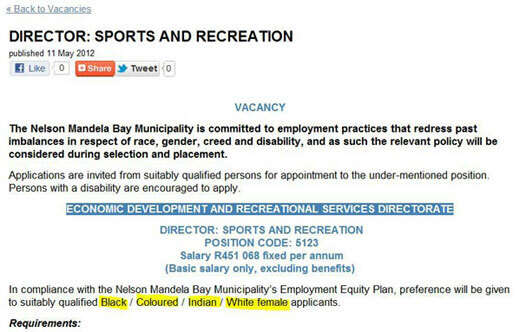 This advertisement placed by the Nelson Mandela Bay Municipality (Port Elizabeth) clearly demonstrates the racism embedded in the law of South Africa today. Where are the voices of protest from the international community today? If Black people (a minority group) in the United States wee discriminated against in this manner, the world would be vocal in their condemnation of the state or federal government practising this policy. Yet the world is deathly silent when the hypocrisy of the the ANC discriminates against White South Africans. And remember, not all white South Africans were supporters of apartheid. Many of us in fact were anti-apartheid activists and leaders in the fight to end racism in South Africa. For which we suffered the consequences for our beliefs. Yet today we are discriminated against by the very people we helped win their political freedom and human dignity! Racism in any form is despicable and must be opposed by all moral people. Voice your protest over the continuation of racism in South Africa. Call on your legislators to introduce anti-racism legislation once again and help all South Africans to economic and social freedom. If necessary boycott the products manufactured by companies that follow the racist laws of employment equity. Refuse to travel to South Africa until this racism is removed from our legislation, and all are equal regardless of race, gender or creed.